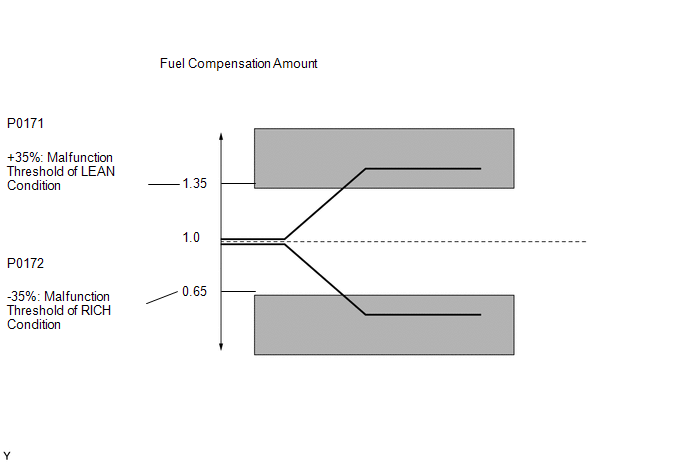 The fuel trim is related to the feedback compensation value, not to the basic injection duration. The fuel trim consists of both the short-term and long-term fuel trims. The short-term fuel trim is fuel compensation that is used to constantly maintain the air fuel ratio at stoichiometric levels. The signal from the air fuel ratio sensor indicates whether the air fuel ratio is rich or lean compared to the stoichiometric ratio. This triggers a reduction in the fuel injection volume if the air fuel ratio is rich and an increase in the fuel injection volume if lean. If both the short-term and long-term fuel trims are lean or rich beyond predetermined values, it is interpreted as a malfunction, and the ECM illuminates the MIL and stores a DTC. With a warm engine and stable air fuel ratio feedback, the fuel trim is considerably in error to the lean side (2 trip detection logic). With a warm engine and stable air fuel ratio feedback, the fuel trim is considerably in error to the rich side (2 trip detection logic). When DTC P0171 is stored, the actual air fuel ratio is on the lean side. When DTC P0172 is stored, the actual air fuel ratio is on the rich side. If the vehicle runs out of fuel, the air fuel ratio is lean and DTC P0171 may be stored. The MIL is then illuminated. When the total of the short-term and long-term fuel trim values is within the malfunction threshold (and the engine coolant temperature is higher than 75°C [167°F]), the system is functioning normally. Under closed loop fuel control, fuel injection volumes that deviate from those estimated by the ECM cause changes in the long-term fuel trim compensation value. The long-term fuel trim is adjusted when there are persistent deviations in the short-term fuel trim values. Deviations from the fuel injection volumes estimated by the ECM also affect the average fuel trim learned value, which is a combination of the average short-term fuel trim (fuel feedback compensation value) and the average long-term fuel trim (learned value of the air fuel ratio). If the average fuel trim learned value exceeds the malfunction thresholds, the ECM interprets this as a fault in the fuel system and stores a DTC. The average fuel trim learned value is +35% or more, or -35% or less, the ECM interprets this as a fuel system malfunction. Start the engine and warm it up (until the engine coolant temperature is 75°C (167°F) or higher) with all the accessories switched off [B]. With the engine warmed up, idle the engine for 2 minutes or more [C]. Drive the vehicle at between 60 and 135 km/h (37 and 84 mph) for 5 minutes or more [D]. If the test result is N/A, enter the following menus: Powertrain / Engine / Trouble Codes [E]. Read freeze frame data using the Techstream. Freeze frame data records the engine condition when malfunctions are detected. When troubleshooting, freeze frame data can help determine if the vehicle was moving or stationary, if the engine was warmed up or not, if the air fuel ratio was lean or rich, and other data from the time the malfunction occurred. If a malfunction is detected while the brake pedal is being depressed, vacuum leaks in the brake booster assembly are suspected. Inspect the brake booster assembly. (d) Warm up the engine at an engine speed of 2500 rpm for approximately 90 seconds. (g) Monitor the voltage outputs of the air fuel ratio sensor and the heated oxygen sensor (AFS Voltage B1S1 and O2S B1S2) displayed on the Techstream. Change the fuel injection volume within the range of -12% and +12%. The injection volume can be changed in fine gradations. (e) Read the Data List twice, when the engine is both cold and warmed up. Between 75 and 100°C (167°F and 212°F). (d) Enter the following menus: Powertrain / Engine / Data List / MAF and Coolant Temp. 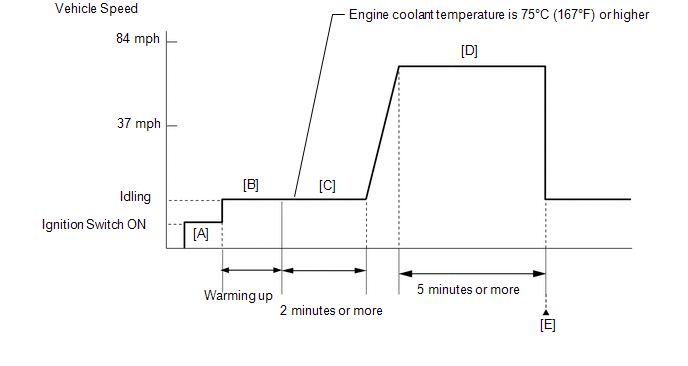 (e) Allow the engine to idle until Coolant Temp reaches 75°C (167°F) or higher. (f) Read MAF with the engine speed at 3000 rpm. Between 8.5 and 12.5 gm/s (shift lever: N position, A/C: Off). If the spark plugs or ignition system malfunctions, engine misfire may occur. The misfire count can be read using the Techstream. Enter the following menus: Powertrain / Engine / Data List / Gas Misfire / Cylinder #1 Misfire Count (to Cylinder #4 Misfire Count). (a) Check the injection and volume. Refer to the fuel injector assembly inspection procedure (See page ). If the fuel injector assemblies malfunction, engine misfire may occur. The misfire count can be read using the Techstream. Enter the following menus: Powertrain / Engine / Data List / Gas Misfire / Cylinder #1 Misfire Count (to Cylinder #4 Misfire Count). (f) Start the engine and warm it up. (g) Drive the vehicle in accordance with the driving pattern described in the Confirmation Driving Pattern. (a) Check the connection and terminal contact pressure of connectors and wire harness between the mass air flow meter and ECM (See page ). If the result of the inspection performed in step 6 indicated no problem, proceed to the next step without replacing the mass air flow meter. (a) Inspect the engine room junction block assembly (See page ).